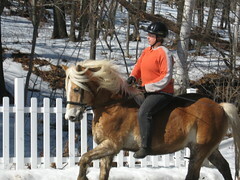 This is a picture from my riding lesson which happened about two hours before I came down with the scrunge, on Tuesday. Is that not the most adorable tank of a pony you ever saw? I did a whole lot of nothing yesterday. Today I might do a little less nothing, and a little more something, but I don't know what. The kids are being verra patient with me. I think I'll go nap. Wheeeee! That pony looks Icelandic! Happy pony! Trotting pony! Yay! I’m sorry about your cold. 😦 I hope you get better soon. I’m taking Monday off, so I might be in Northampton a bit longer than I had at first thought. oh doe dot a code. feel better.